October may be coming to a close, and with it Fair Trade Month, but that does not mean conscious consumption has to go out the window. But let's also think critically about what ethical and sustainable consumption actually means. Labels such as Fair Trade and Organic provide us as consumers with more information; they tell us something about how a product was produced, or what labor standards were in place, or whether producers received a decent wage. And for the most part these tools in our capitalist society are good, and to some extent necessary, in order for people to make informed decisions. However, it is also easy to become complaisant; enter the mentality that if I buy only these products I will be doing my part. As part of being a conscious consumer, though, is doing our homework and continuing to hold these labels we've begun to trust accountable for their promises. Fair Trade, for example, requires that producers conform to specific labor and environmental standards, and cuts out the middleman by linking farmers directly to companies. An NPR article last year noted the rising controversy over scaling up Fair Trade for plantations of traditionally small-scale crops. Different standards and certifying bodies increase the murkiness of the issue, and decrease the transparency for which the certifications are aiming in the first place. So, my advice as an aspiring conscious consumer? DO buy labeled products; more information is better than less. DO dig deeper and learn about what that specific label actually means (if you need a reference, check out this handy ecolabel index!). DO consider both environmentally and socially responsible labeling. DO support small scale - so many alternative and artisan chocolate companies source directly from farmers. And DO ask questions - companies, particularly newer and smaller ones are happy to field inquiries and provide more information if requested. 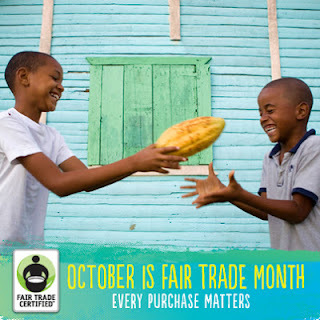 This is a cool infographic explaining Fair Trade. A nice article in the New York Times on Green Mountain Coffee Roasters.